Call center is the most important department of an organization and the reason to it is the criticality it brings to the business. One must collaborate all factors responsible like technology, manpower, training to streamline its customer service because an effective and efficient call center will help you greatly in retaining and fortify the relationship with your customers. Because of multiple factors involved and the critical role each plays it is important to have a detailed and thorough understanding of each. Being a Contact Center Solution provider we understand that the installation and management of call own call center software & hardware is not only a complex process but has its limitations too. Apart from managing it 24X7 with a proper Server room and a skilled resource, one has to have provisions for scalability and redundancy too. Being a Cloud provider we maintain not only the hardware and software at our end but also ensure complete redundancy and scalability is offered so that their is no intermission in service. With our extremely commodious service, you can help your business grow to the next level. A virtual contact center solution helps you manage your Contact center calls as well management of your agents with its centralised system irrespective of the location of the agents. Its real-time statistics and thorough reports give you the complete understanding of your Contact Center and lets you take instant decisions to increase its efficiency. It gives the control to you to optimise the resources in the best possible way. Track every critical metrics in real-time for better management. Get interested leads data by taking their consent to contact via Missed Call Campaign. The solution helps to capture the campaign effectiveness. 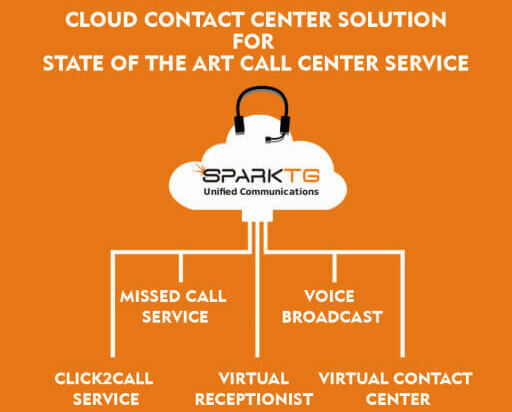 SparkTG is a leading cloud based Unified Contact Centre Solution provider in India. With over Eight years of experience in developing state-of-art customised contact centre solution across various companies in different industry verticals, we consider ourselves as an established and true cloud based contact centre provider.